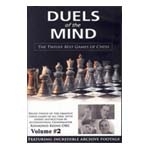 A four-volume series by British GM Raymond Keene, discussing in detail what he considers to be the all-time twelve greatest games of chess! The greatest games of the Classical period of chess. Full of style and mathematical precision, these games demonstrate the developing science of Master-level play.